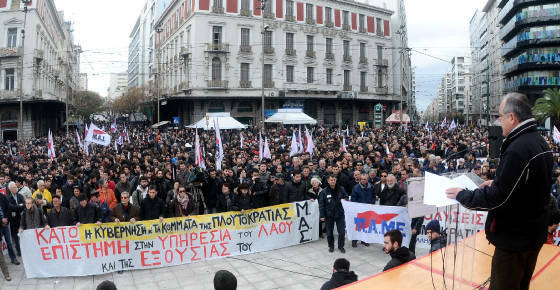 The President of the Workers’ Party, Michael Finnegan, has said that the people of Greece must not be made scapegoats for the failure of capitalism and he described attempts to marginalise and punish Greece as “reprehensible”. Mr. Finnegan said that the sustained attacks on Greece by all of the other EU countries, led by Germany and France, were completely unacceptable and that the Greek people, and in particular the Greek working class, were being made pay for the wider systemic failures of capitalism. The Workers’ Party President said that Greece had been subjected to outside interference in its affairs for centuries and in the 20th century had suffered invasion, bombardment and starvation at the hands of the countries which are now attacking its people with forced austerity. Again, the completely illegal threats by Germany, France and the EU Commission that Greece will be dumped out of the Euro-Zone highlights further the complete lack of democracy at the heart of the EU project. “The Workers’ Party extends its solidarity to the working people of Greece and our warm fraternal greetings to the Communist Party of Greece (KKE) and to PAME, the all-workers militant front, which are leading the fight-back against austerity. The workers of Europe, whether they be German, Greek, British or Irish are not to blame for the crisis, they are victims of a vicious and ruthless ideology called capitalism which is in deep crisis because of the innate contradictions within it. Workers must refuse to be the scapegoats of failed capitalism. They must resist austerity and the real reason the Greek workers are being attacked is because they are in the vanguard of that resistance”, said Mr. Finnegan.